Pros: Gold investing is a very popular choice right now, and gold bullion prices are high. 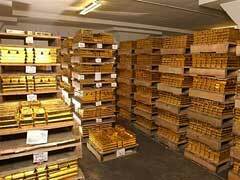 Buying physical gold means storage and other issues that many investors do not want to worry about though. A gold bullion ETF offers you the benefit of owning bullion without having to take possession or pay to store this metal. A gold bullion investment can be a fantastic opportunity, especially in a slow economy. When the stock market is down and the economy is poorly performing the prices of precious metals usually go through the roof. And since economy has a very cyclical pattern, smart investors always keep some of their portfolio funds in this type of market. Think of it as insurance against inflation. Cons: One of disadvantage of a gold bullion ETF is that these funds may have a higher volatility. This means that there may be higher risks involved with these investments. Careful research is needed to protect your investment capital, so you keep the risks as low as possible. There’s a fee of owning shares of exchange traded funds and they are accessed in the form of funds’ managing fees. However, there are always no load funds for you to consider. Why pay for something when you can get it for free? Another con with a gold bullion ETF is the tax considerations. When you sell your coins on gold bullion market, in many cases you may have to pay a capital gains tax on your gains. Some think that with an ETF this may not be the case. Alas, just like with owning physical bullion your capital gains tax rate is still 28% because gold investment is categorized as “Collectibles”. Paper gold as some may refer to exchange traded funds that track the spot price of this metal is something intangible for many investors. Many fear that in the times of economic uncertainty and domestic currency collapse there would be no way for claim your investment when with physical coins or bars you will have a chance of economic survival. A gold commodity can be a good option for your investment needs, but using ETFs are not ideal for every investor. A precious metals exchange traded fund can offer you many advantages, but there are also some drawbacks involved. Only you can determine whether these funds fit well with your investment goals and strategies.